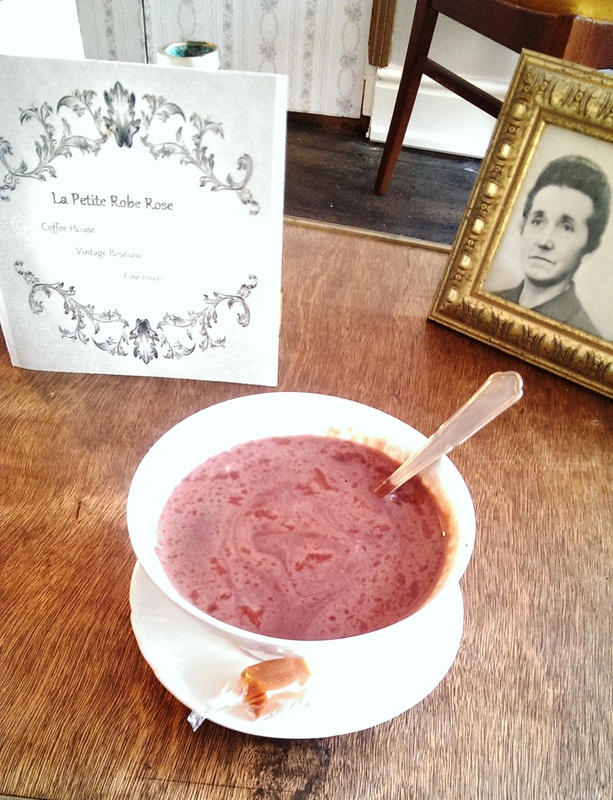 Edited October 2015: Sadly, La Petite Robe Rose has now closed down. And this was my first sample – a delicious chocolat. Molten chocolate in a bowl. Heaven. The café, which is done up to look like a 50s French living room, is run by Damien, who had the vision for it in July this year. Supported by his Aunt Catherine, he went ahead and bought the space, gave it the 50s style makeover and secured a vintage clothing supplier (yep, it sells vintage clothing too) and it opened in September. Take a moment to let that sink in. It went from a vision to reality in just three months. I know. Damien also bakes all the homemade cakes on offer in the cafe. Every day. The coffee is divine (and I don’t usually drink coffee) and the salted caramel that comes on the side is dangerously more-ish so I’ve yet to buy a whole bag (but I will!). If I get the opportunity to stop by without Mushroom, I also attempt a little French conversation with Damien (I need to practise!). So, when I saw that Catherine was starting a ‘French club’ for pre-school aged children I was interested. She explained that it was just stories, songs and games rather than a ‘teaching’ approach. As I’m a firm believer that the best way to learn a language is to immersive yourself in it and have fun, I thought we’d go along to the first one to try it out. Ou est le papillon bleu? Bravo Mushroom! Catherine was great with Mushroom, who initially laughed hysterically any time she spoke to him! At first, he didn’t speak at all but apparently that’s common. 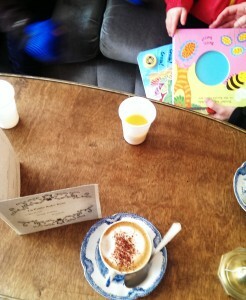 He got involved with the singing (well, the actions) and especially liked reading about Spot the dog in French. The second time we went along he even said a few words! The main thing though, is that he had fun. If he doesn’t start speaking French, that’s ok but if he does (and to be honest I’d be surprised if he didn’t) he won’t even be aware that he was learning as he enjoys himself so much! My only reservation about this class is not actually about the class… The first time we went, Mushroom shared some cake with me. The second time, he asked for cake… You can see a pattern forming here. I can’t blame him, Damien’s cakes are hard to resist! If you’re local,* interested in learning French (you will learn along with you child if you don’t speak any already!) and available Thursday mornings, maybe I’ll see you there? *Even if you’re not local, it’s worth the journey – trust me. Make up a story Mummy! I quite like making up stories. Now, if you’ve read this blog before and especially if you also follow my other blog, Honest Speaks, this will come as no great surprise. What might be surprising though, is that even I have my limits. Not long after Mushroom realised that a bedtime story without a book is one made up by Mummy or Daddy, he started to demand them and add his own details to them. At first this was cute. He’d add the friends he’d most recently seen as major characters and tell me what was going to happen next. I’d go with the flow and adapt to his suggestions. It didn’t take long for me to realise that usually the additions to these stories are his way of processing the day’s events, especially things that have particularly affected him – either positively or negatively. So we’ve had stories about friends shouting at each other, stories about kids being naughty and getting told off, and more recently, repeated stories about holidays to Turkey and going to watch fireworks. I really want to foster his creativity and I know that repetition is important for him to process major life events but there are days when he’s up at 6.30, jumping into our bed, shouting “Mummy make up a story!” with further requests for the same story (with minor changes) at regular intervals right up until he finally falls asleep at the end of the day. No let me be clear, I’m not complaining (well ok maybe I am sometimes, a little). There is nothing wrong with Mushroom asking for the same story over and over. It’s a healthy part of his development and I love his creativity. I mean, in his stories he takes all his nursery friends on holiday with him and they stop ‘naughty’ dragons and witches not by fighting but by telling them they love them and becoming friends! Mushroom is just perfect. But I am not. Some days I tell him “I’m just going to read a book, ok? NO MORE MADE UP STORIES!” or even “Mummy has been making up stories all day and is tired. Read yourself” and I hand him a book he knows and can ‘read’ himself. This usually ends in tears though, as it doesn’t help him process whatever is going on in his head at the end of the day. Still, like I said, sometimes I have my limits. 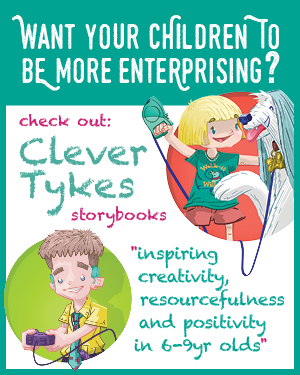 Do you make up stories for your kids? Do you ever get fed up with it? I’m especially interested in those who regularly make up stories for work too – is it just me who doesn’t always have the patience? Please share in the comments below and reassure me I’m not the only imperfect parent in the room! Mushroom and I received our second book from Parragon Books last week. We’ve only been Book Buddies for a month but Mushroom is already aware of what the big white envelope means. It arrived while he was at nursery and I showed him when he got home. “That’s my book Mummy.” He knew without me having to tell him! So, after dinner he opened his new book very carefully. The excitement of a new book! 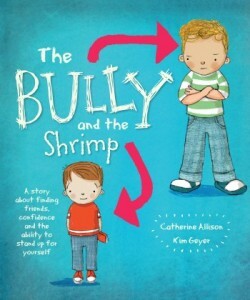 The book tells the story of small-for-his-age Noah Shrimpton, who is picked on by the class bully after moving to a new school. He has no friends to support him and is afraid to tell anyone what’s happening. Through both the storytelling and Noah’s doodles in his journal, which is beautifully illustrated, we follow Noah as he makes new friends and gains the confidence to stand up for himself. 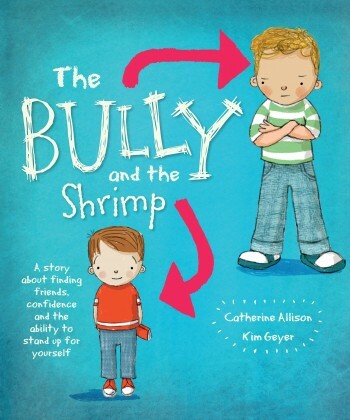 Developed in conjunction with school teachers and child development experts, this book is aimed at school-aged children and their parents and is an excellent way to raise the subject of bullying and how to deal with it, to young children. This couldn’t have come at a better time for us. While Mushroom is not being bullied at nursery, he is a sensitive soul and spends a lot of time with some of the more confident kids. This is good for him I think, as he comes out of his shell when he’s with them but he is also easily hurt. He recently had a big argument with one of his closest friends and it really upset him. 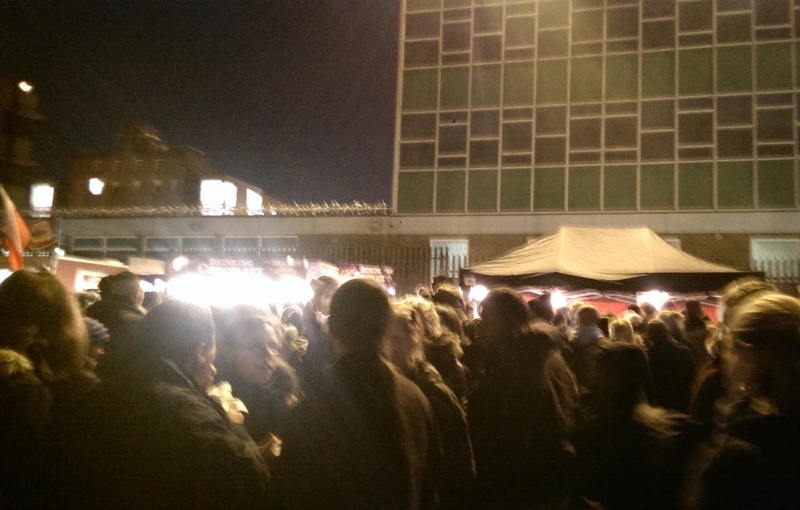 I couldn’t understand what the argument was about but it was clear there had been some shouting and name calling. 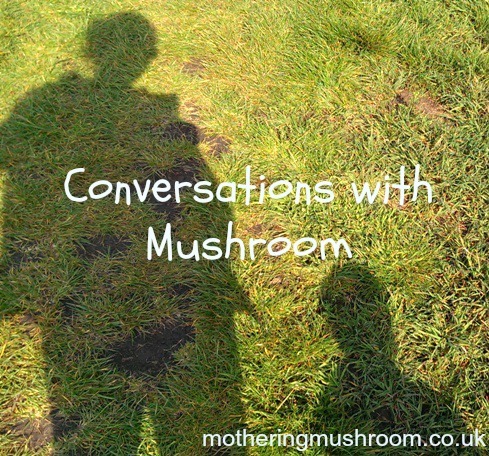 Mushroom told me “It made me feel poorly in my tummy Mummy” and that he didn’t say anything himself while being shouted at. The argument can’t have lasted more than two minutes but it affected Mushroom for about a week. After reading Noah’s story, I asked Mushroom what he would do if someone was mean to him, even if it was a friend. He told me “I will say NO!” and smiled. We did talk about telling a grown-up too – either a keyworker at nursery or Mummy or Daddy at home – but I particularly liked that the children in the book were able to resolve the situation for themselves without adult intervention. I will definitely be going back to this story with Mushroom, to reinforce the message and hope that it encourages him to stand up for himself a bit more. 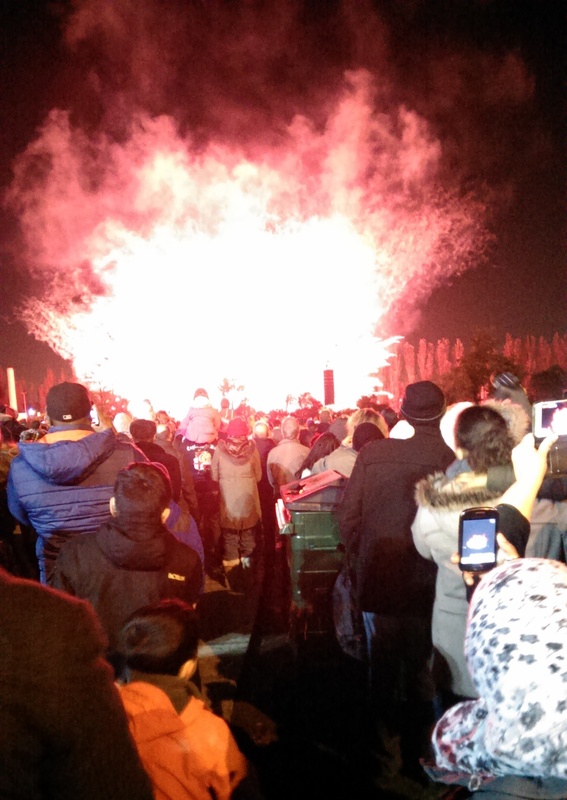 This week I went to my first fireworks display. Mummy tried to take me last year but it rained so it was called off. I tried to hide it but I was devastated so I have been waiting ALL YEAR for this! 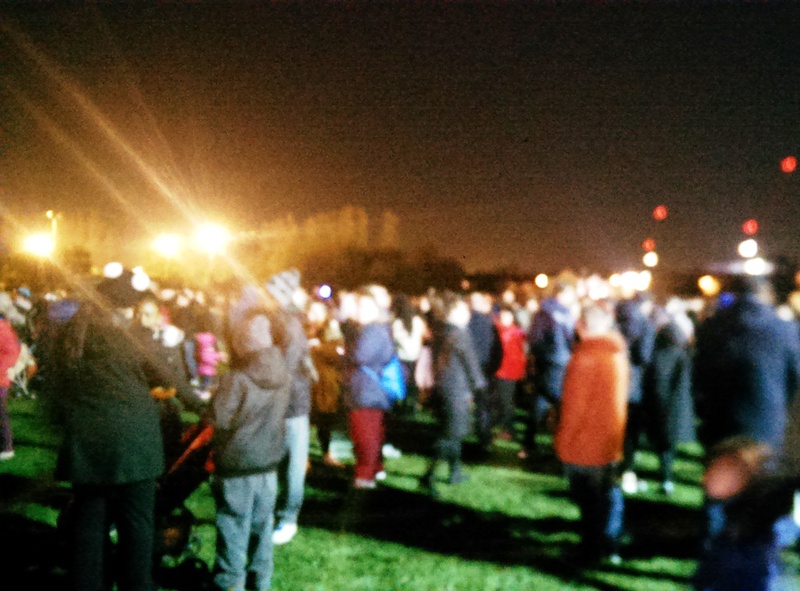 Mummy and Daddy picked me up from nursery and confirmed that it was not raining and we would be going to see Waltham Forest’s firework display. Yay! We got the bus down to Walthamstow and I was so excited I kept laughing to myself. Mummy kept saying “You crazy baby.” I’m NOT a baby! But I was so happy I didn’t bother to correct her. When we finally arrived there were a lot of people waiting. A Lot. Some of them had fire on sticks! Mummy said the sticks are called ‘sparklers’ and that I’m too young to have them. She said maybe when I am big, like six. They were a bit scary anyway so I wasn’t too upset and Daddy softened the blow by getting me a lightsabre instead. 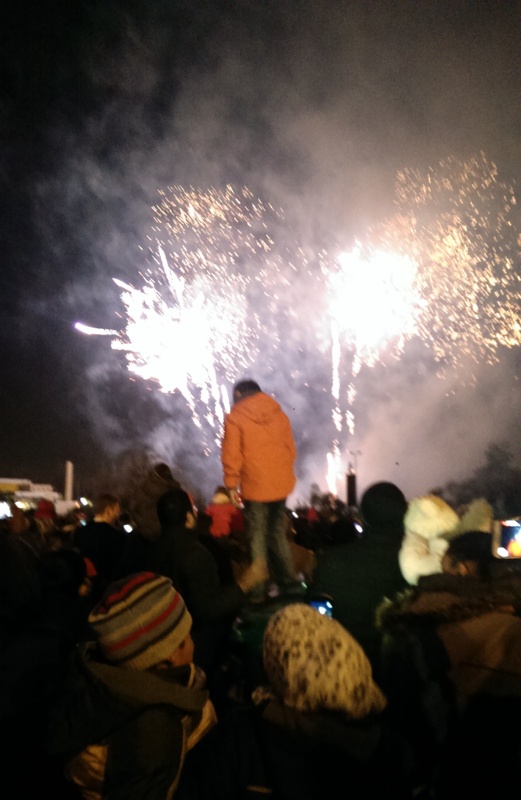 While Daddy waited in the queue, me and Mummy talked about sparklers and listened for the man saying when the display would start… Daddy just made it back in time! It started with some words… “You’re only supposed to blow the ______ doors off!” A lot of people laughed at this and I kind of wanted to know what word ______ was but was too busy watching the sky light up to ask. They played music from the movies and Mummy and Daddy kept laughing at some things but I’m not sure what was funny… I didn’t know some of the songs but liked ‘Ghostbusters’ and ‘Girls just wanna have fun.’ – I know that one because my Auntie sings it on youtube! And when they played Let It Go I sang along: “The cold never bothered me anyway.” Actually, the cold did bother me a bit so I was glad Mummy made me wear my iron man onesie over my clothes! 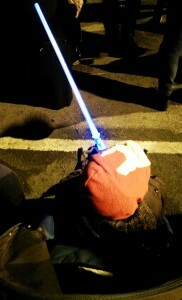 This kid had The. Best. Seat. The show ended with music I liked and Mummy said it was from Star Wars. I wanted to watch it all over again but I was very tired by then (and my ears hurt a bit. 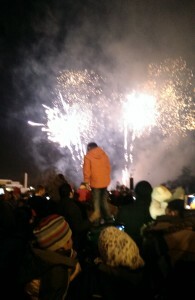 Fireworks are very noisy) and fell asleep as soon as I got back in my buggy. I can’t wait til next year! I am linking this post up to Coombe Mill‘s Country Kids . Click on the image below to find out more. Me: *raises eyebrow* Daddy didn’t? Did you, Mushroom…? Mushroom: No! But Daddy didn’t anyway. Can you fix this? Me: Yes, but I’ll need superglue… and don’t worry about it, accidents happen and you can still play with it. Me: Oh yes, I haven’t done anything about fixing it yet have I? Mushroom: Yes, it’s a bit special. My glue is not superheroes one. But I can try! Mushroom: *hands me car covered in Pritt Stick* My glue is not a superheroes one.